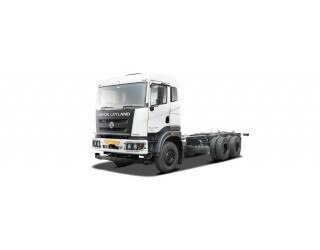 Nov 9, 2018: The Ashok Leyland Captain 2518 is a powerful truck built with a customisable chassis with cabin setup which can be tilted. It has a total vehicle weight of 25,000 kilograms. The Captain 2518 is designed with focus on driver's comfort. Hence it is offered with adjustable seat with armrest along with host of other features. As for the braking, the truck has air brakes with parking function, anti-lock braking system, etc. Other safety features include hill hold, seat belt, fog lights and power steering. Under the hood, it is powered by a BS-IV compliant engine that can make a maximum power of 180 bhp at 2,400 rpm along with a peak torque of 660 Nm at 1,200 RPM.